A new “Coming Soon” section highlights upcoming releases. Apple is releasing some updates to Apple Music today that will make it easier to see what new music is on the way and when it's set to arrive. 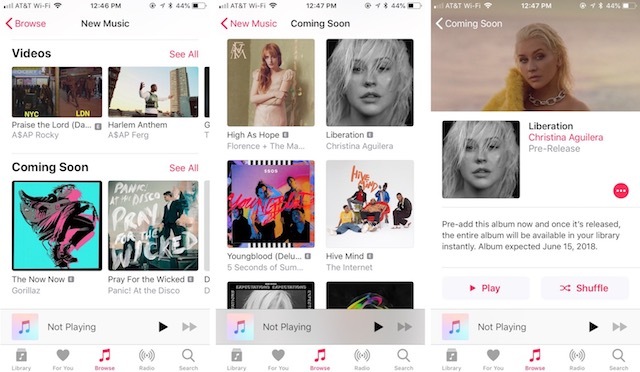 MacRumors reports that a new "Coming Soon" section is rolling out to both the iOS and macOS versions of the music streaming service and it currently shows upcoming albums from artists like Florence + The Machine, Interpol and Gorillaz. To get there, go to the Browse tab, select New Music and then scroll down until you find the Coming Soon section. Tapping the albums listed will bring up additional information like the expected availability date and track listings. Expected release dates are also now available on some upcoming albums' Apple Music pages even when the albums aren't listed in Coming Soon. Additionally, it appears that artist profiles are getting tweaked as well. On iTunes, MacRumors notes that the artists' portraits are now circular and Featured Releases are highlighted along with their release dates. And a play button appearing next to the artist's name will shuffle their music. Apple Music, which hit 40 million subscribers in April, has been gaining on rival Spotify and to boost that effort, Apple is now working on its own music publishing division.